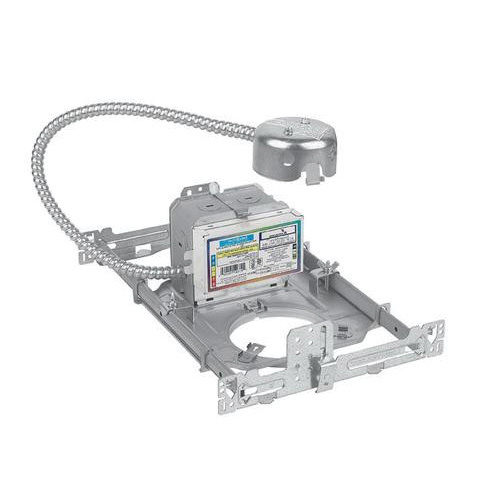 Lightolier Uniframe™ Collection New construction frame-in kit includes mounting frame, trim clips, junction box, Uniframe™ mounting system, ballast, socket and socket housing. Mounting frame features 20-gauge galvanized steel construction and junction box features 22-gauge galvanized steel construction. The push in/twist out stainless steel trim clips hold reflector flush to ceiling. Housing made of galvanized steel attaches to reflector trim by spring clip. This frame-in kit is ideal for damp locations. The ballast accommodates one 18-Watt triple compact fluorescent lamp. Frame-in kit is cULus listed.